When you live in this part of Texas, you rarely see snow - and even when we do, it's only a dusting! When we do see it around here the entire town shuts it's doors, school is cancelled, and traffic comes to a complete stand still (we also don't know how to drive in it)! 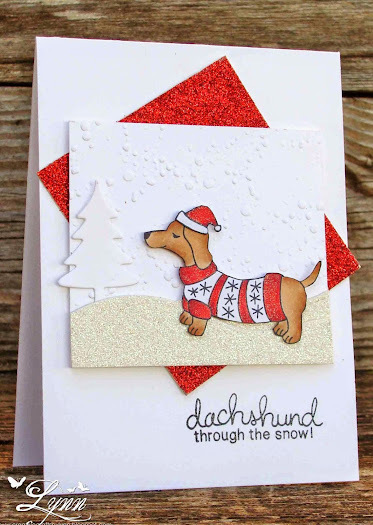 Since little Rambo (our doxie) has never seen snow I'm not sure what he'd think of something like that. I just image it'd be a little chilly on his belly though! He does love a nice little patch of green grass and sunny skies. This cutie is one of the stamps from the Holiday Hounds set from Newton's Nook. So many cute stamps in that set! I marked through "the" in the sentiment and added a handwritten "no" and then sponged in the sky and added the die cut grass. 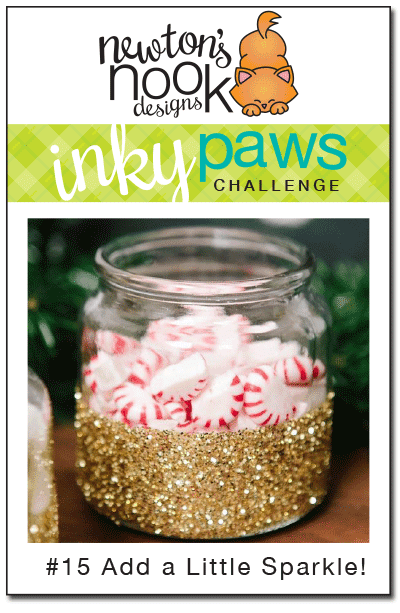 I'll enter this in the following challenges: Inky Paws Challenge at Newton's Nook (Christmas) and Addicted to Stamps and More (Holiday). 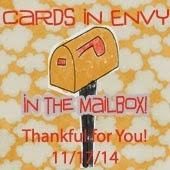 The big T-Day will be here tomorrow!!! T-Day, as in Thanksgiving, here in the states. If possible, everyone will sit down to a big meal of turkey, dressing, and all the trimmings - and give thanks for things in our life. As soon as I saw this big guy from QKR Stamps I knew I had to have him. He looks exactly like my brother! LOL! My brother may not be as chubby as this, but this is what he looks like when he comes every year at Thanksgiving and the food is on the table. He's ready to "dig in" and fill the belly with turkey for the year. He even has that grumpy cat (turkey) look on his face! 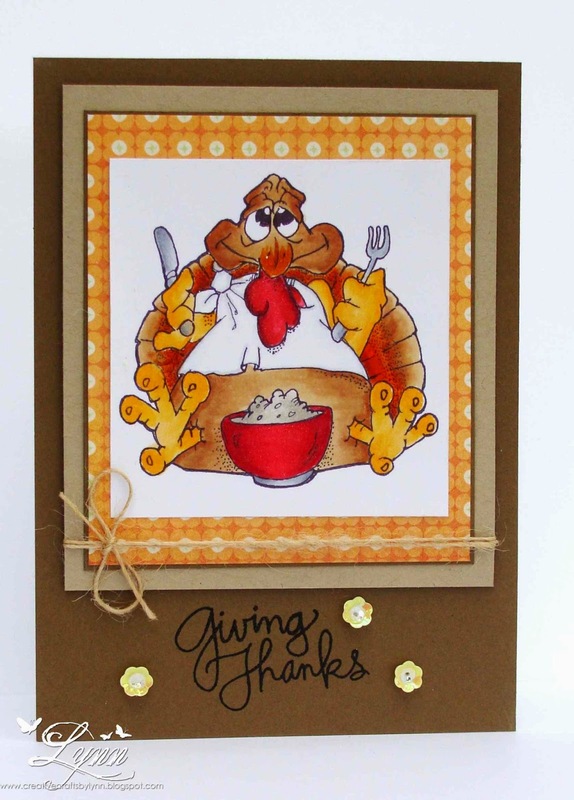 This turkey is just thankful he's at the table and not ON the table! I colored this in Copics and then added some shine with the Wink of Stella clear pen. 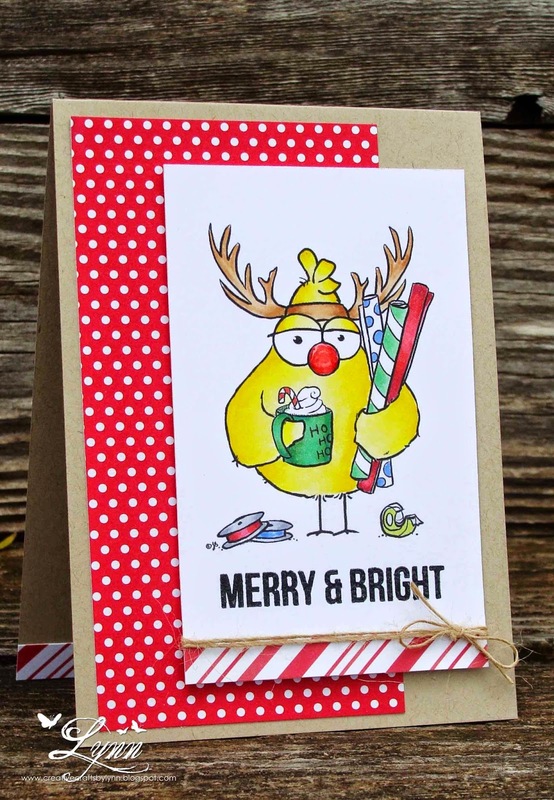 The patterned paper is from My Minds Eye and the sentiment from Simon Says Stamp. Some yellow/gold sequins were added and then tiny clear sequins added to the center of the larger ones. If you celebrate Thanksgiving, I hope you have a wonderful day. I'm so thankful for all of you! You bring so much inspiration into my life and I value your friendship. Thank you! Happy Monday to everyone!!! We're starting a brand new challenge over at Squigglefly and would love for you to play along. If you use one of the Squigglefly images found in the store and enter, you could be a winner. Our theme this time is Dear ( use this word in your sentiment) - or use a Deer on your card. 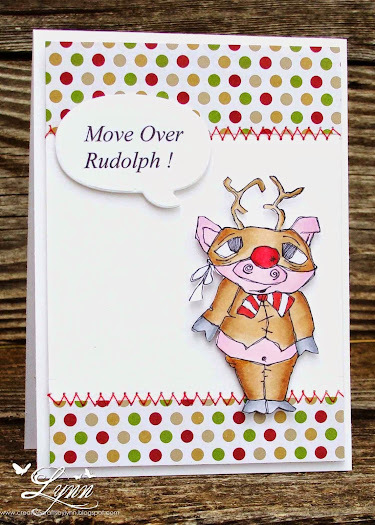 I've used this fun image from Sandra Caldwell called Reindeer Piggie along with a computer generated sentiment! 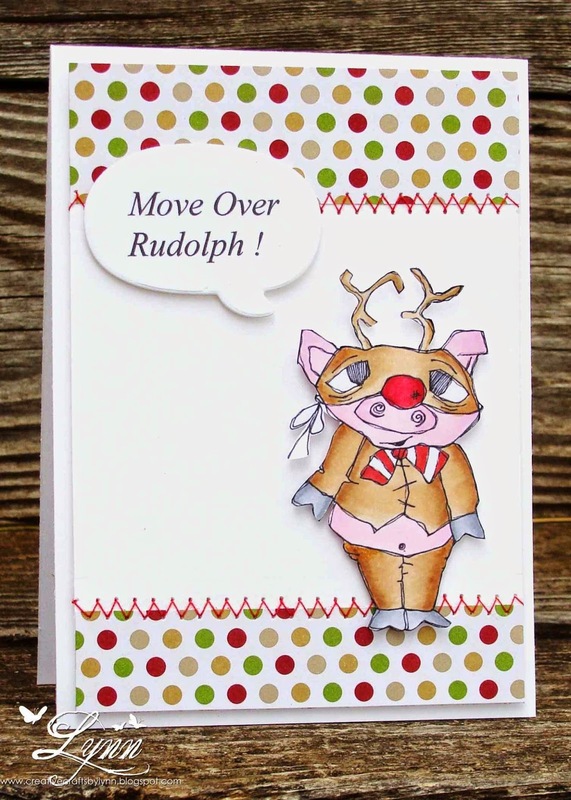 Here's the deal.......little Mr. Piggie wants to lead Santa's sleigh on Christmas but is having a really hard time convincing all the other reindeer that he could do just as good a job as any of them. He finally found a little brown costume that looks like Rudolph so he's crashing the reindeer herd in hope that Santa will select him to lead the sleigh! I personally think he has a very good chance of doing just that! On Christmas morning if you look out the window and see Reindeer Piggie pulling that sleigh, give him a great big wave and blow him a kiss! 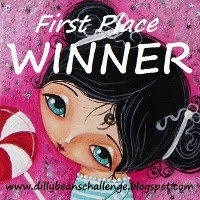 Thanks for stopping by.............and be sure and check out the Squigglefly challenge! This is pretty much a CASE of a card I saw recently in a online card class. I used the same die and design but that's about it. 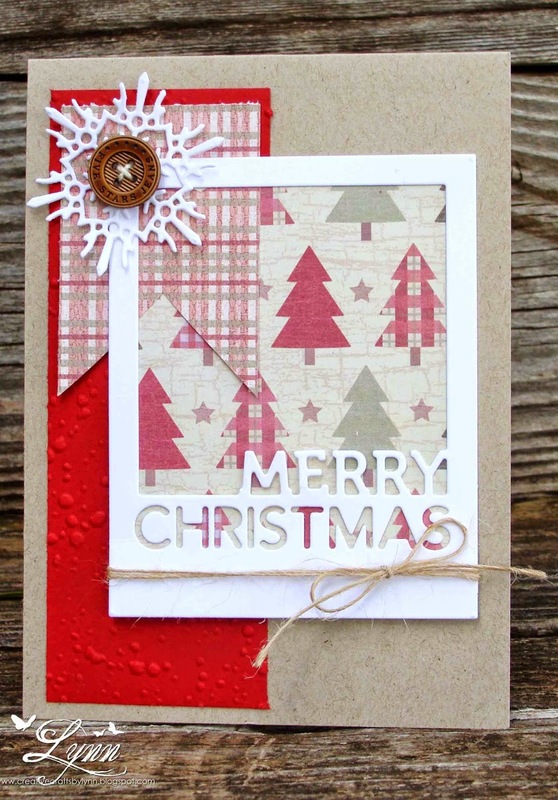 The die is from Simon Says Stamp and the patterned paper is from Paper Studio. Mainly just some scraps I had left over from another project. 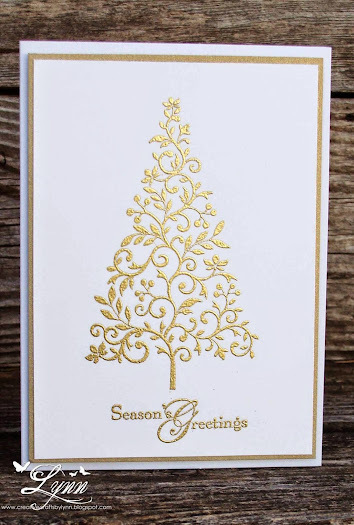 The card base is Kraft card stock. It's a little different for me and almost to the point of being "busy", but it's another Christmas card completed. I usually send my Christmas cards out the first week of December, but that's going to be hard to do this year I think. I'm getting ready to shower you with Christmas cards! 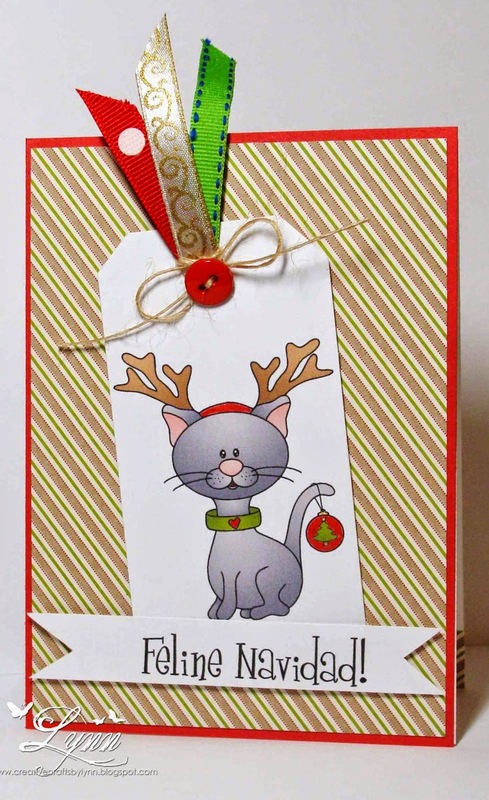 I'll enter this in the challenges at Pixie's Crafty Workshop (snippets) Dies R Us (Christmas-Anything Goes). Scrapy Land Challenges begins again today and our theme this time is to Use Texture. 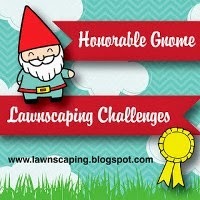 Be sure and see all the rules over at Scrapy Land Challenge and enter. Make sure you use at least one of the brands of dies from the store. Below is a list of all the brands that Scrapy Land carries. It's really not the time of year around here to see many butterflies but I think they're beautiful no matter what season it is. 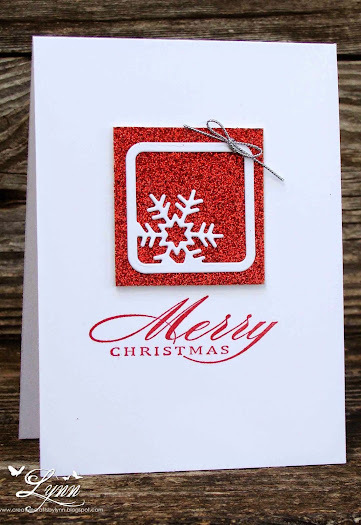 For my card today I used a stencil and some embossing paste for the texture. The butterfly was completed using the Fancy Butterfly die from Impression Obsession and some patterned paper. Pearls were added to the body of the butterfly. The sentiment was heat embossed in white on a scrap of vellum. I added the vellum with some stitching leaving the ends of the thread dangling. 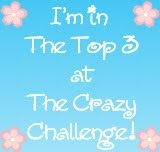 Be sure and enter our challenge at Scrapy Land Challenge for a chance to win a wonderful prize package. It's about that time once again.......yep, Thanksgiving is on it's way! Mom has the pie and Pa has the corn! Just wondering who's bringing the turkey!! I used these darling little Pilgrim owls from Deedee's Digis. This is pre-colored but also comes in the line version you can color yourself and also has some really cute sentiments. I added a little Wink of Stella to the images to give them shine - but they're so cute they actually shine all by themselves. 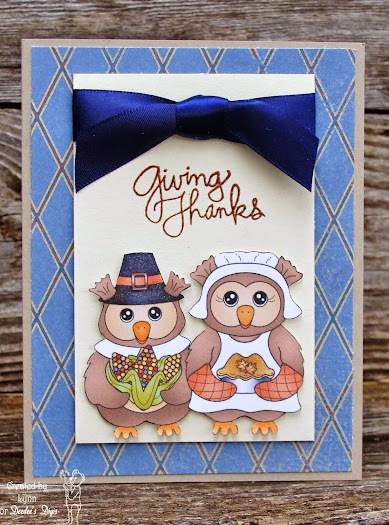 The patterned paper was added to some Kraft card stock, the little owls cut out and popped up, and the the navy ribbon added along with a stamped sentiment. 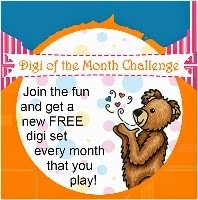 Be sure and check out Deedee's Digis as we have a progressive challenge each month and you'll want to join in on all the fun. I love to see what other people do with watercolors and they're always so pretty! I didn't have any watercolors and finally decided to bite the bullet the other day and buy just a very inexpensive set at Michael's. Um.........I'll just say this......I'm glad I didn't invest a lot of money in them! Maybe with practice I'll get the hang a little better. I kept this as easy and simple as could be by just smearing some of the colors for the sky and stamping this image from Crackerbox Palace. I love the image for guy cards and since I have a few guy birthdays coming up soon I thought I'd give it a try with watercoloring. If they like the color purple I have scored a hit! 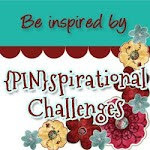 Another challenge at Tuesday Throwdown begins today and we have the theme of Swirls and Pearls! We're being sponsored by Sweet and Sassy who also provided the images for the DT. Be sure and stop by and see all the rules and then enter for your chance to win! Although we really don't need another four footed friend in the house right now, I'd love to take this precious little puppy home with me! 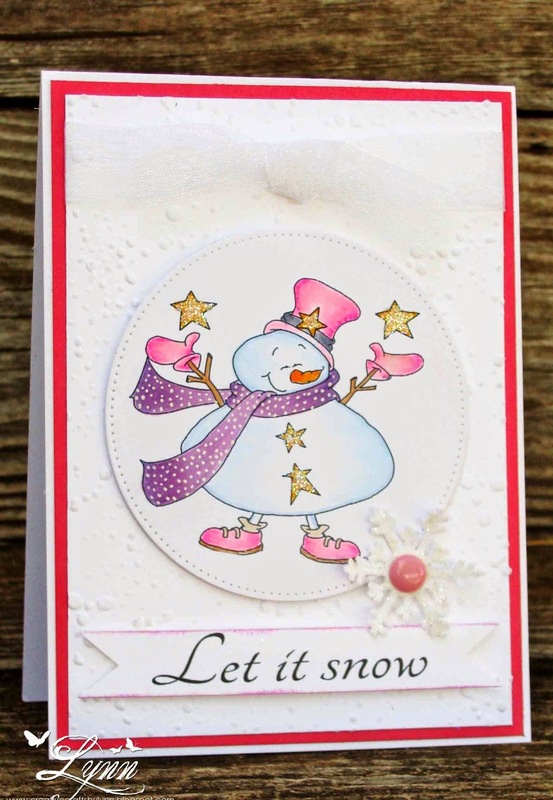 I colored the image in Copics, added the swirly peppermint paper, the sentiment, then the snowflake and pearl. Thanks for stopping by.....and be sure and head on over to Tuesday Throwdown! 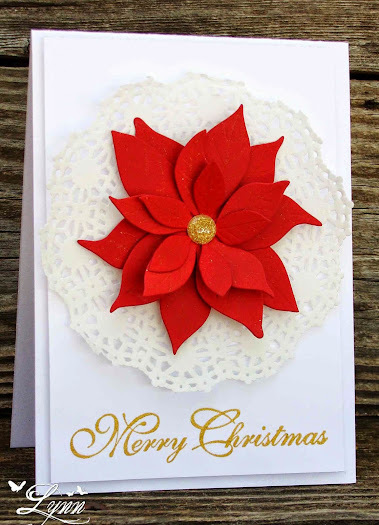 It's time for another challenge from Squigglefly and our theme this week is Christmas - with Non Traditional colors as a twist. Check the challenge for all the rules and enter for your chance to win. Be sure and see all the wonderful creations from the DT too! 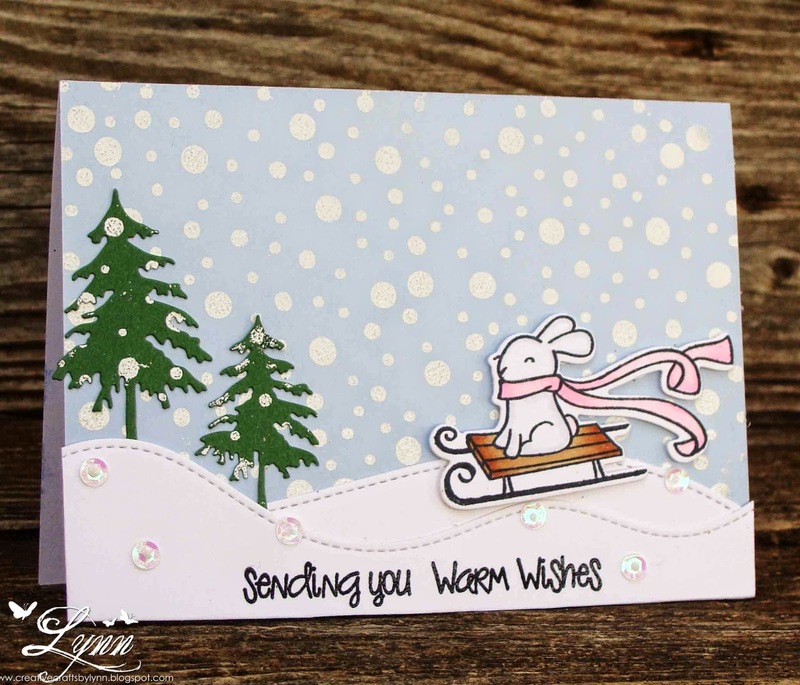 This cute little snowman is called Star Light, Star Bright by Cheryl Alger. This is a new image in the shop and you'll not only find this one but so many more. Plus, there's a new artist this month (Sal Scheibe) that has some beautiful images you won't want to miss. My snowman is colored in non traditional colors using Copics and then some shine added with the Wink of Stella Pen. 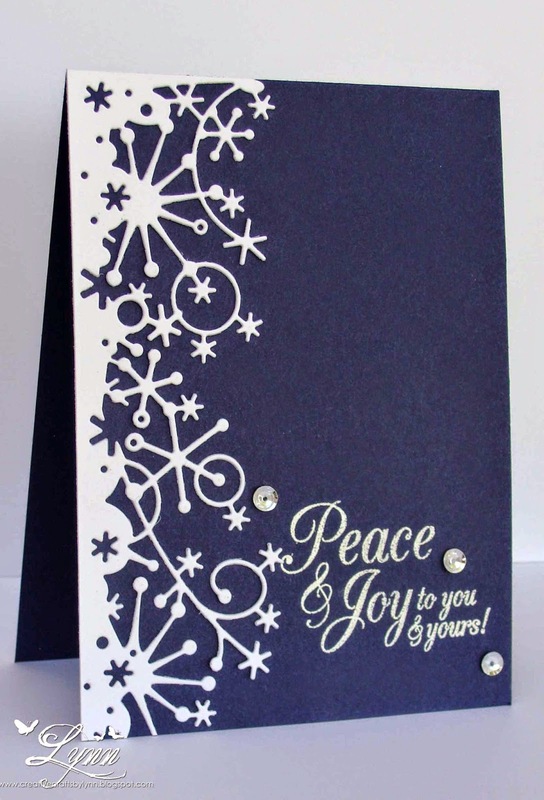 The embossing folder is called Snowfall from Sheena Douglas. 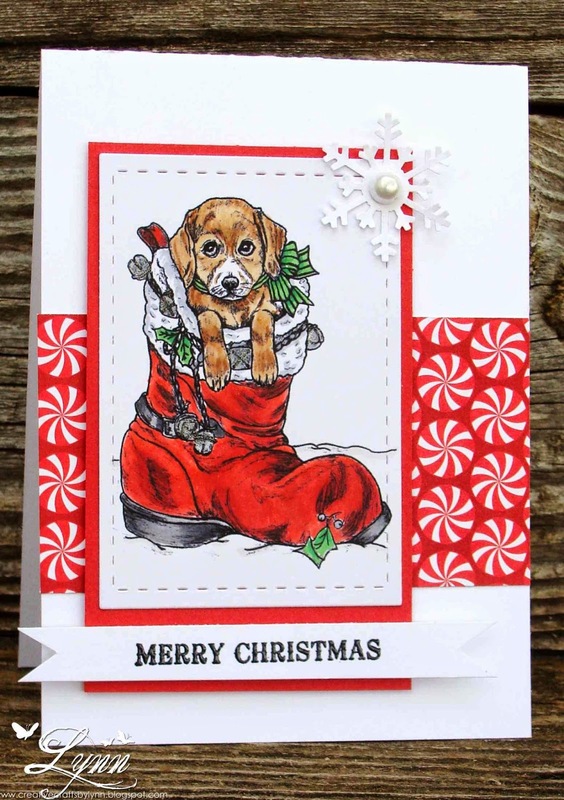 The sentiment is called Christmas Medley by Jess Holland. 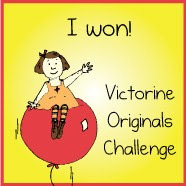 Thanks for stopping by........and be sure and check out the Squigglefly challenge! Don't know if this guy is drunk from the booze or flies, but all you have to do is look in his eyes and know he's had just a tad too much fun! 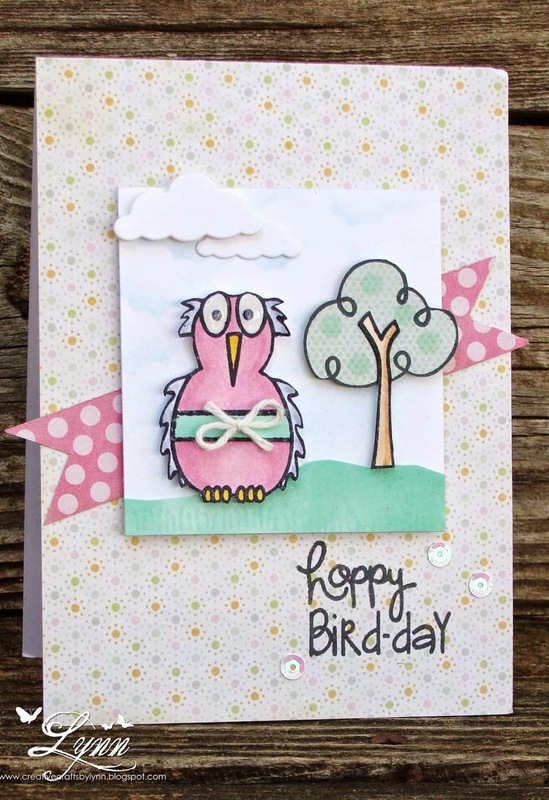 A fun card for a very special someone with a birthday tomorrow!!!! We're back again with an Anything Goes challenge over at Scrapy Land! 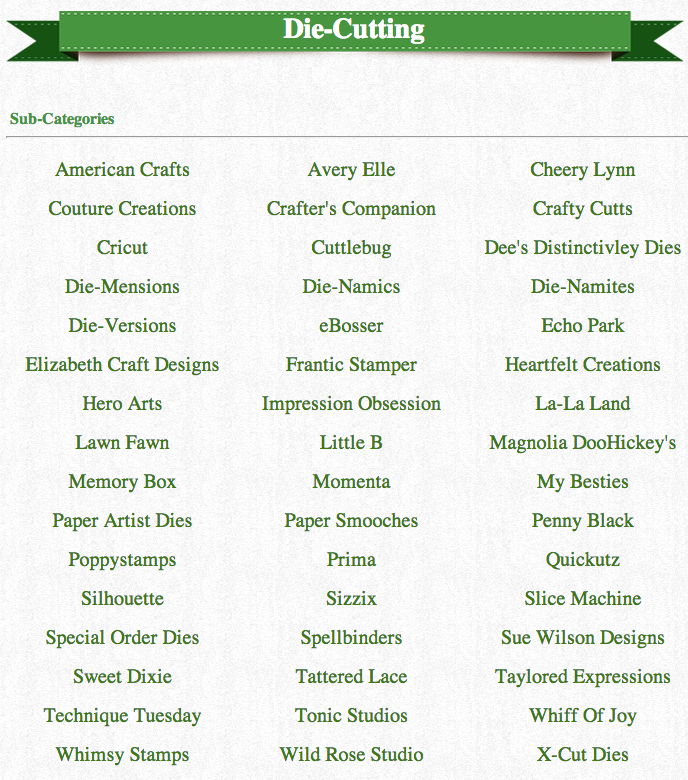 Anything goes this week but just be sure you use one of the brands of dies that are sold in the Scrapy Land store. Check out all the rules of the challenge and enter for your chance to win! Be sure and see all the inspiration from the DT also. I really wasn't happy with this card at all but it does look better in real life. I used a stencil and distress paint and then sprayed it all with some gold metallic shimmer stuff. 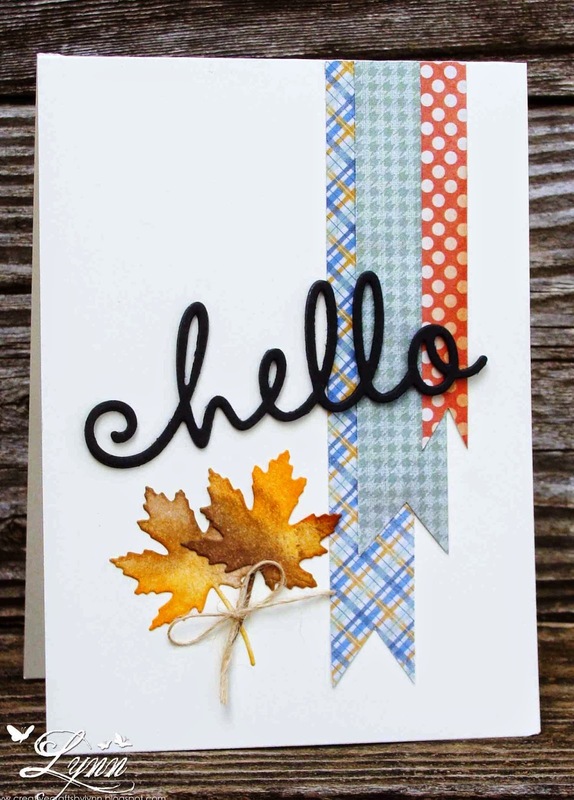 This was mounted on a piece of burlap and the "hello" die from My Favorite Things added. Here's a link to the die in the Scrapy Land store. I added a snip of some lace and then the dew drops. This one is so much more my style!!!! 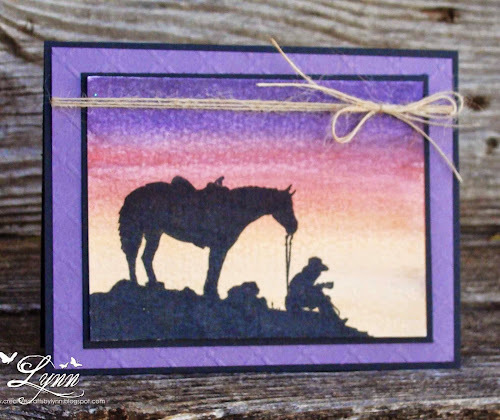 Clean and simple and yes, a "git 'er done" type card. I used the same die on this one (notice I cut the tail off the "h" in "hello" in that first card - I keep seeing "chello" instead of "hello"! LOL!) I also used some die cut leaves from Impression Obsession (that can also be found in the store), smashing some distress inks over them, and then adding the piece of twine. The banners were done with some scraps I had left over from another card. Look out!!! There's a moose in the kitchen! This cutie comes from a new digi set in Deedee's Digis and you can get it beginning today. 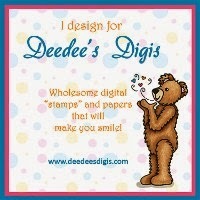 It also comes with digi paper and sentiments - and in pre-colored images or line images that you color yourself. 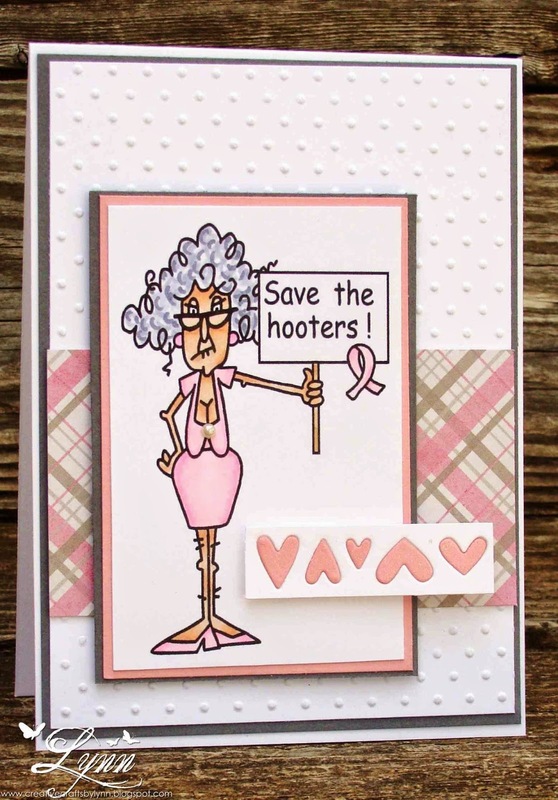 It's also the start of another progressive challenge at Deedee's so be sure and grab this little cutie (unless you played along last month and received it for free) and come on over and enter your creation. Once you enter you'll get next months image free! I used the line version of this little gal and colored her with Copics, making a few polka dots on her apron. The snowflake paper is from Deedee's that comes with the set and the polka dot paper are some scraps I had. This tag was SUPPOSE to be photographed with a loaf of banana bread that I cooked the other day.......but, Jim and I ate it before I could get the photo! 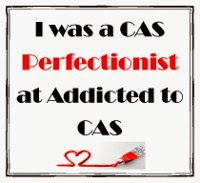 What can I say! 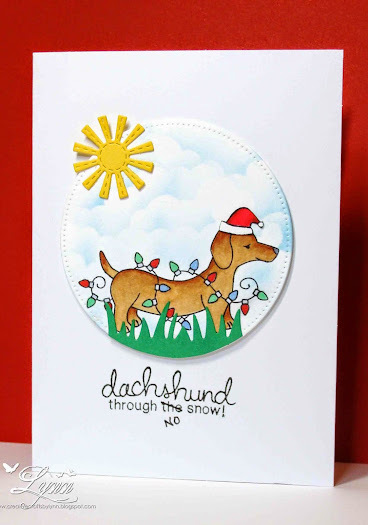 Yep, you know me.......I LOVE those little dachshunds! Of course I love Rambo (our doxie) more but I actually love all of them! As soon as I saw this set of stamps from Newton's Nook I knew I HAD to have it. TOOOO cute and so much fun! There's several images of dachshunds and sentiments and each and every one of them are wonderful - and get ready because you'll be seeing me use this stamp set a lot! A few dashing deer today! I had all these scraps on my desk from left over cards and figured it was time to get them off and do a little clean up around here. Not too much clean up though for sure! 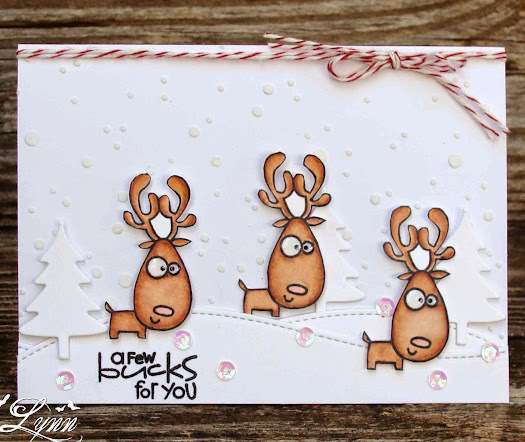 These little guys and the sentiment are from Paper Smooches. I used a die from Lawn Fawn and from Simon Says Stamp for the scene and also used embossing paste with a snowflake stencil for the "snow". 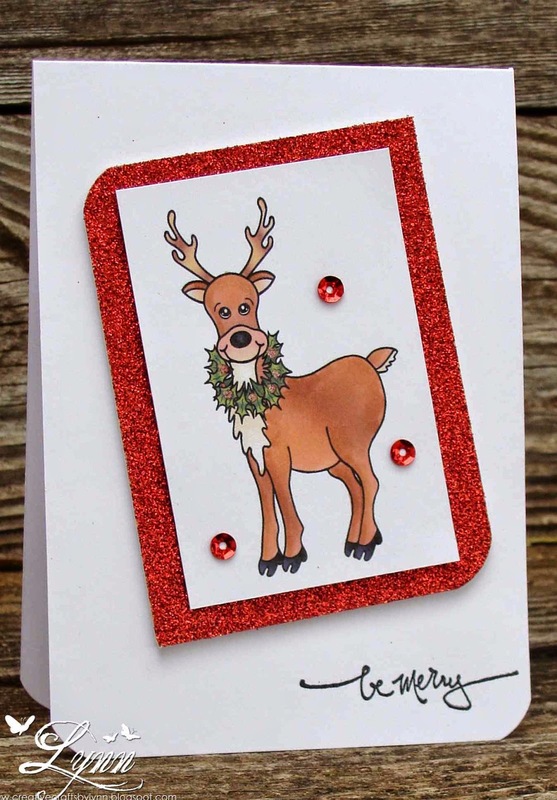 A few sequins were added, the deer popped up, and it's a done deal. Deer season is getting ready to start around here in the next couple of weeks and you can really tell since all the guys are now dressed in camo - just waiting for the big day. I swear they must have camo undies on too.....guess that'd come in handy out in the brush if you had to drop your pants for some reason or another though! 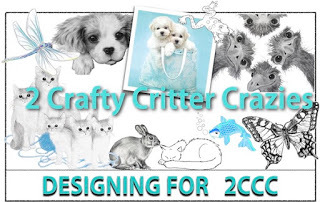 I'll take these little guys over to Pixie's Crafty Workshop for her challenge on snippets. This may be it until next week. I need some type of lightening bolt of inspiration to hit me pretty quick I think - or at least a couple of days where life doesn't seem to interfere with my fun. Another challenge is starting today at Tuesday Throwdown with the theme "Dress Up". 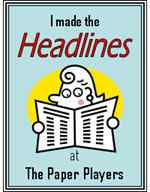 We're being sponsored by Chi Chi Memories, who also provided the images for the DT to use. The winner will receive a wonderful prize package from out sponsor so be sure and come on over and play along! I used the little Tiger Girl. She's a cutie all dressed up for the Trick or Treating day. How about that set of white teeth on that costume!!!! The costume looks like it's getting ready to gobble her up! Of course that could be hair too I guess - but really liked the way it looked like teeth! Either way, it's a fun image! Thanks for stopping by........and be sure and check out Tuesday Throwdown this week! In case you haven't heard yet, the World Series is in full swing - or maybe it's even over with by now!! This little gal would love to play in it though! We're starting another challenge at Squigglefly this week with the theme "Frame It". 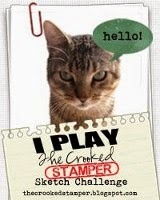 We'd love to have you play along with us - unless you're already playing in the World Series! This cute little image is from Cheryl Alger and called Batter Up. You can find her in the Squigglefly store along with so many other images! I used one of the Polaroid frames to showcase this little girl. The panel behind her is actually a gray-ish color but appears brown in the photo. I added the twine and wooden star as accents. 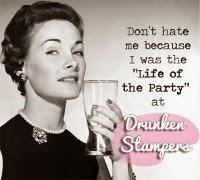 This is MY kind of gal! When I was growing up I was the only girl in a neighborhood full of boys. I learned to play baseball with the best of them. The only thing different in the image that doesn't resemble me is that I would have NOT had on a pink shirt - or bow in my hair! I really thought I was just one of the guys! Come on over to Squigglefly and play along for your chance to win. Check all the rules on the blog. 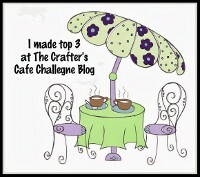 Since the day isn't over with I'll enter this in the challenge over at Pixie's Crafty Workshop (snippets)! Happy (almost) Halloween! This is the last of the Halloween cards for the year! YEA! 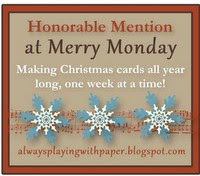 I'm really ready to move on over to Christmas now - or even maybe a few cards for Valentine's Day! 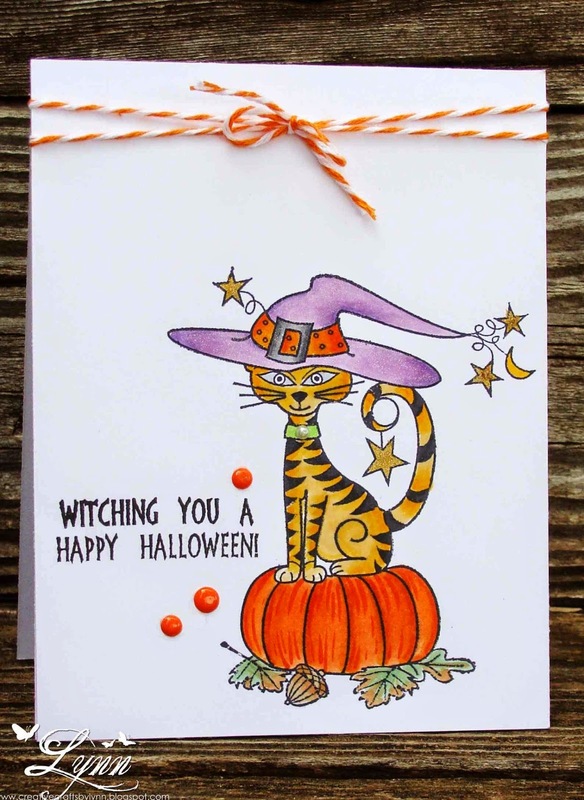 I was at Michael's the other day and found this cute Halloween image from Hampton Arts on sale for 60% off. 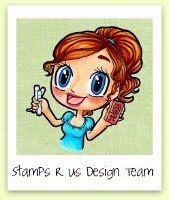 Gotta love deals like that - plus it's really a cute set of stamps. 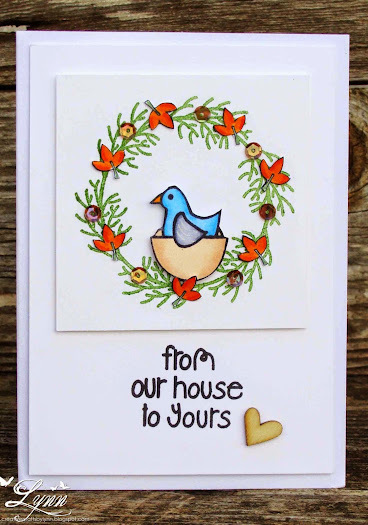 This is a large image so all I added was a sentiment from Chicken Girl Designs (very old), some enamel dots, and the twine. The stars were colored in with a gold Wink of Stella pen and then I went over the hat with a clear Wink of Stella pen. Of course I just had to add a little pearl to her collar too! I shook it up and made a Santa shaker card!!! Pretty much of a terrible story all the way around. Before I get to that though, just wanted to say that this cute little Santa is from Paper Smooches! 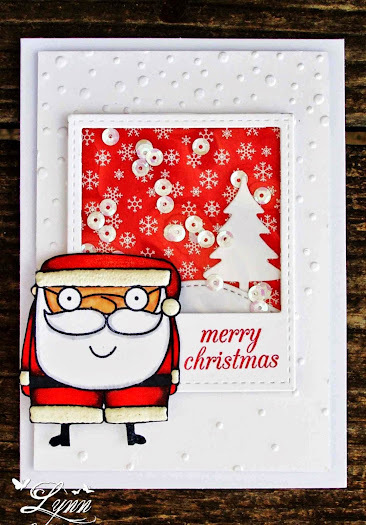 CUTE set of stamps too and I love this Santa to pieces! 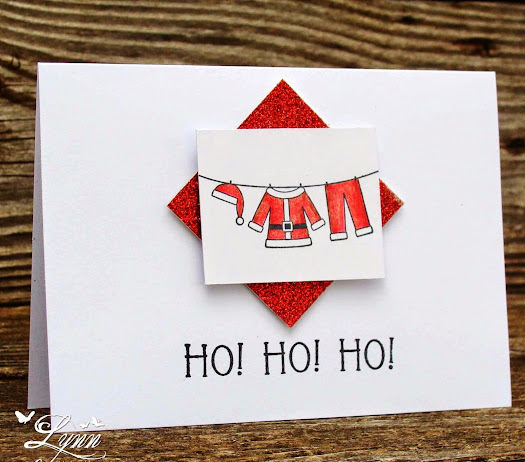 Stamped Mr. St. Nick, added the Liquid Applique, and cut him out. For some unknown crazy reason I decided to make a shaker card with him! NO problem - every one else can do it and so can I! I'd never made one before but it just couldn't be hard.......right! Got the acrylic stuff glued on the frame and then added the dimensionals. Of course I added them to the wrong side - so started over! Finally got it all put together again, added the sequins, and then made my card! YEA! I did it!!! Picked the card up and shook it - it's so cute with those sequins floating around in there - and they all fell out on the desk! Yep!!! You don't even want to know some of the words that came out of my sweet little mouth! LOL! Where's the hole! I couldn't find where they were coming out and in case you haven't noticed those dimensionals really stick - and aren't coming apart! Ok, started over again! Finally got it all finished and now the sequins float around perfect.......Way too much work for me though and don't know if I'll ever tackle a shaker card again! 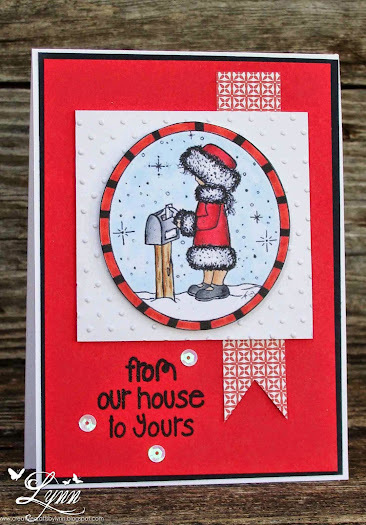 I'm going to enter this in the Anything Goes challenge over at Paper Smooches Sparks! 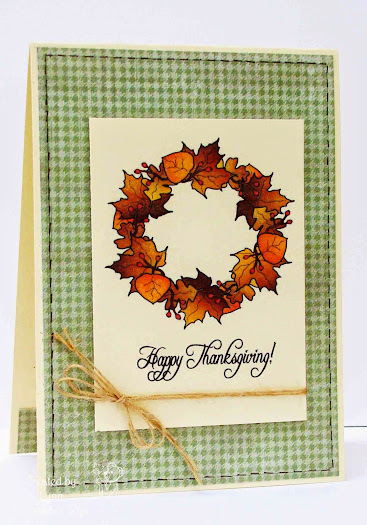 A little fall wreath today using some stamps from The Alley Way Stamps. I first stamped the wreath and added that cute bird at the bottom. The leaves were stamped separately, colored, cut out, and added along with some amber colored sequins. Lastly, the sentiment and wooden heart added. 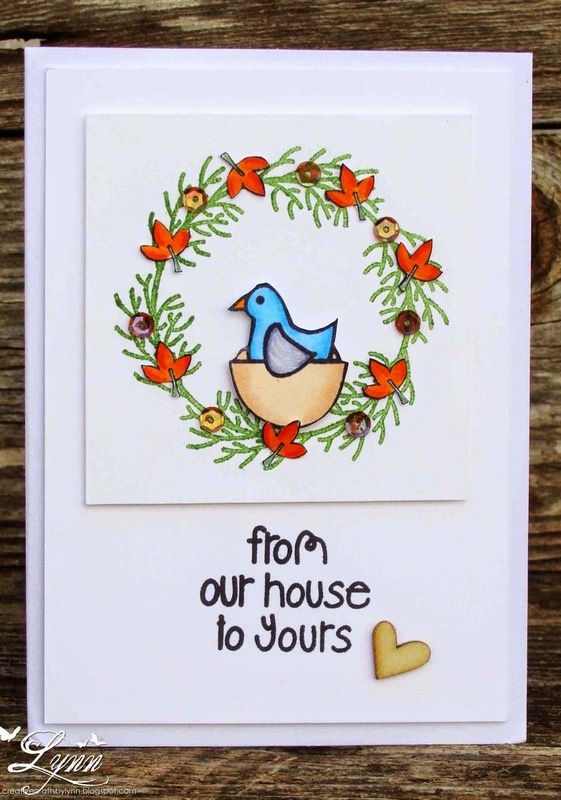 The wreath, bird, and sentiment are from the Wreathed in Love set and the tiny leaves from Crazy Critters. 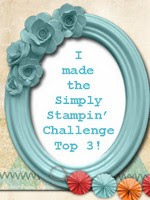 I'll enter this in the Be Inspired Challenge for The Alley Way Stamps. 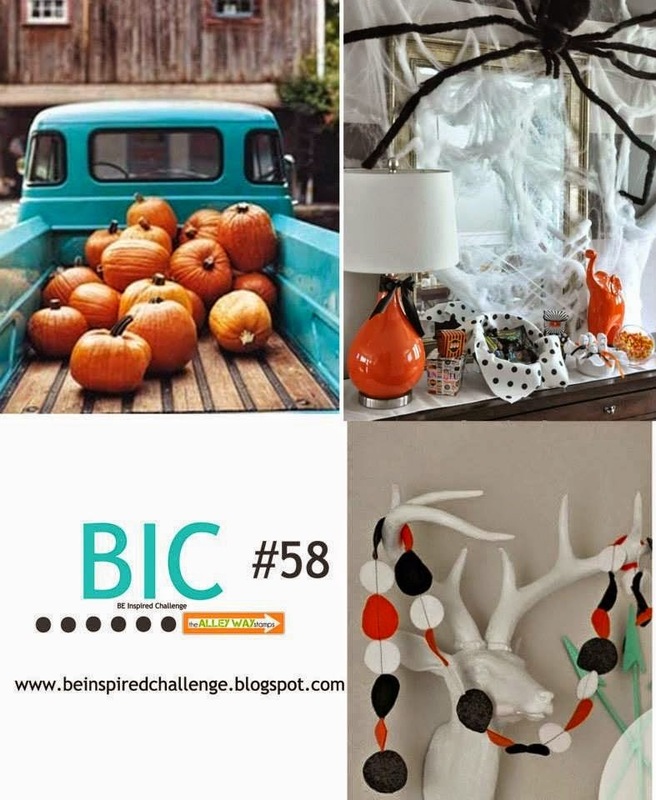 I was inspired by the colors in the panel on the left - green for that tree in the background, orange for the pumpkins, blue for the color of the bird, and the wooden heart due to the bed of the pickup truck. No tricks, just treats this weekend! 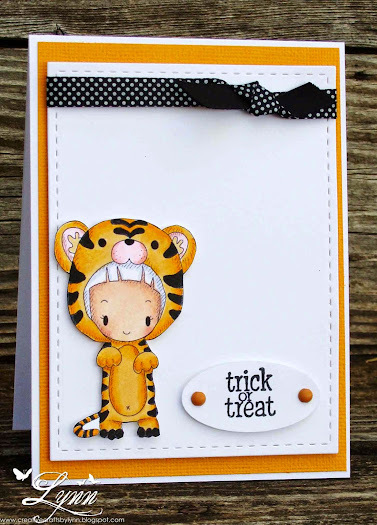 For every $1.00 spent in our store this weekend ( 10-18-14 through midnight central standard time 10/19/14) you will be entered into a drawing to win a grab bag of 10 Halloween images! Winner will be announced on our blog and here on Facebook on Monday, October 20th. Be sure and check out Squigglefly and all their wonderful images this weekend! 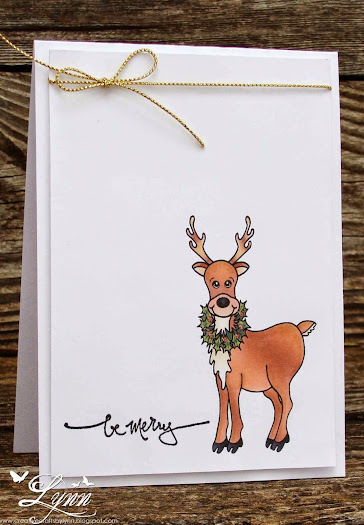 I used a stamp and die from Lawn Fawn (Monster Mash) on my card today along with some Kraft paper and a scrap of black and white polka dot paper. Added a button, ribbon, twine, and some fun enamel dots and it's all ready to be mailed out for Halloween! 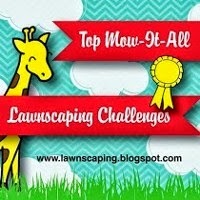 Be sure and stop by Scrapy Land, see the challenge rules, and enter your creation! 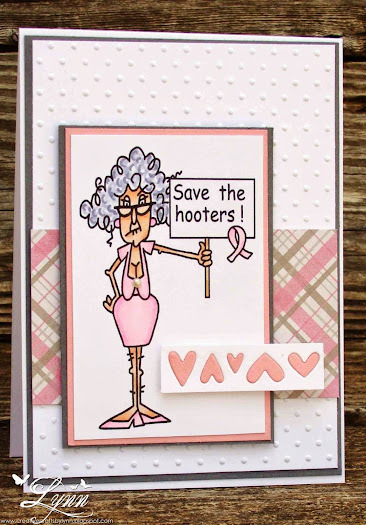 Stella is on a mission to Save the Hooters! 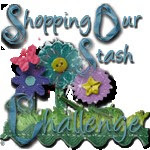 She's already popped over to Tuesday Throwdown for this weeks challenge to spread the word since the theme of our challenge this go-round is Awareness! 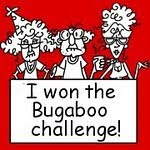 Come on over and play along with us and you could win a wonderful prize package from our sponsor Bugaboo! You just gotta love Stella! I colored her in Copics and then used patterned paper from Recollections. I cut out a heart die and then added the pink in the negative pieces. A little embossing, a pearl on Ms. Stella's dress, and the card is complete! 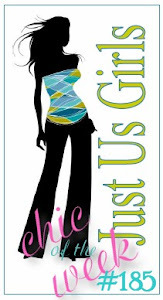 Head on over to Tuesday Thrown and enter for your chance to win! HUGE announcement - I am now part of the Squigglefly DT! Great images, wonderful artists, fantastic design team, whoa.......can you tell I'm excited!!! 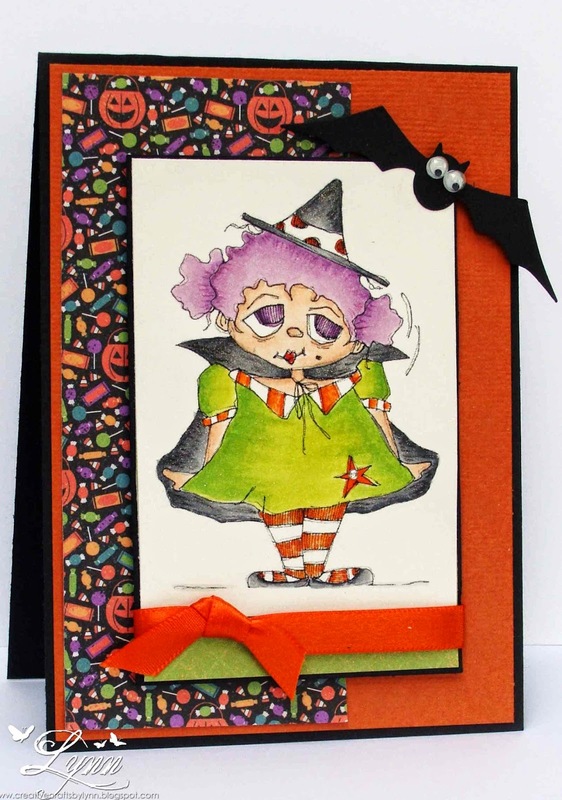 Our challenge at Squigglefly this week is to use pumpkins or the color of pumpkins on your card. This should be easy with fall and Halloween right around the corner now. I used an image from Sandra Caldwell called Costume Witch. What a cutie, right! She's colored in Copics and then I gave her cape and hat some shine with the Wink of Stella Pen. 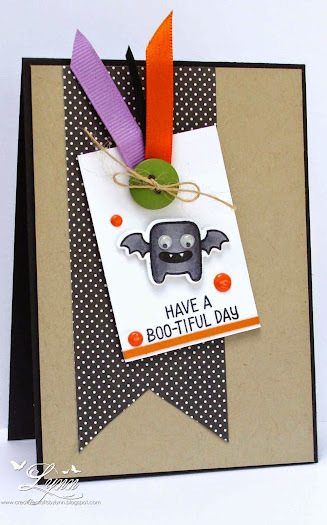 The patterned paper I used is from DCWV and the textured card stock from American Crafts - and then that little bat with googly eyes just had to be added. Head on over to Squigglefly, see all the inspiration from the DT, check the challenge rules, and then enter your card for a chance to win! 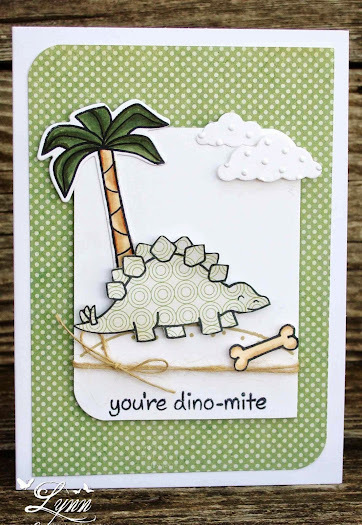 A little dino card for one of the grandsons. I think all little boys love the dinosaurs - no matter what their age. For my card today I used several sets of stamps from Lawn Fawn - Critters in the Past for the dinosaur, palm tree, and sentiment, Life is Good for the sand/dirt he's standing on, and Critters in the Dog Park for the little bone. 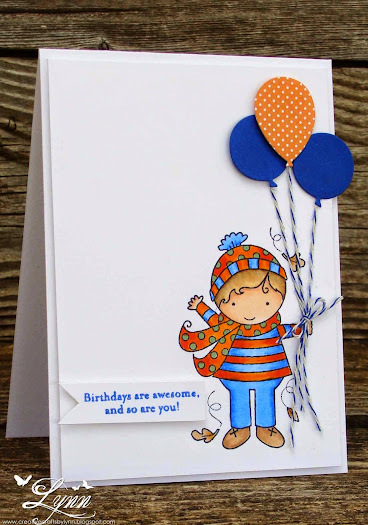 The patterned paper is from DCWV Dots Stack. 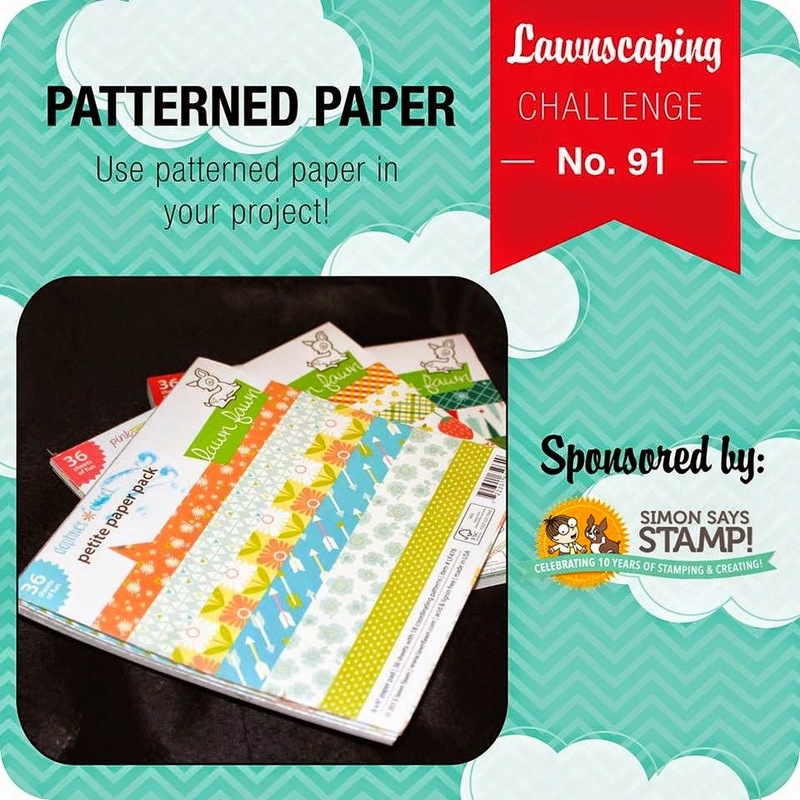 I'll enter this in the Lawnscaping Challenge (Patterned Paper). White is NOT white! Ok, so this is white card stock and a white doily (gotta love the cake decorating section at Wally World!). In the store, it really looked so white - slapped it on a card and it's not bad. Took a picture and yikes!!! Not white at all it seems! So typical of something I'd do! White card stock, not so white doily, red poinsettia with SB die, a bit of Wink of Stella clear, gold glitter enamel dot for the center, and gold embossed sentiment. That's it for today because I've just basically been worthless for the past couple of days and haven't been crafting much. Sad, I know! 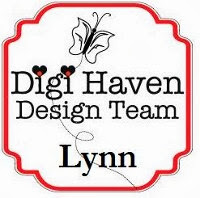 I'll enter this in Pixie's Crafty Workshop (snippets) and A Gem of a Challenge (Clean and Simple). There's all sorts of fun happenings going on at Deedee's Digis right now!!! Through today we not only have a great SALE, but also a FREEBIE (like this), and a CHALLENGE! Be sure and go to Deedee's today and check out all the fun before it ends tomorrow morning! 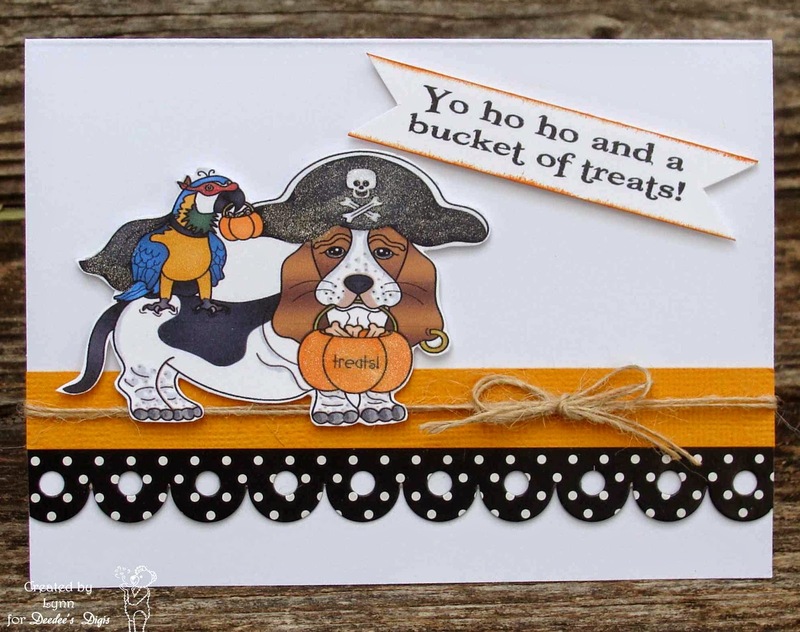 Since I have a friend that raises and rescues basset hounds AND parrots I thought this would make an adorable card for her. This image is FREE - through tomorrow morning only - and yours for the taking. We'd love to see you make something with it and enter our challenge too. This is the Pre-Colored image but you also get the line version you can color yourself. It comes with some fun sentiments too. I just printed and then cut out the image - and added a ton of Wink of Stella clear to the hat, cape, and pumpkin. The black polka dots is something called an Edger - basically a sticker. I've had it in my stash forever and have no idea where it came from. 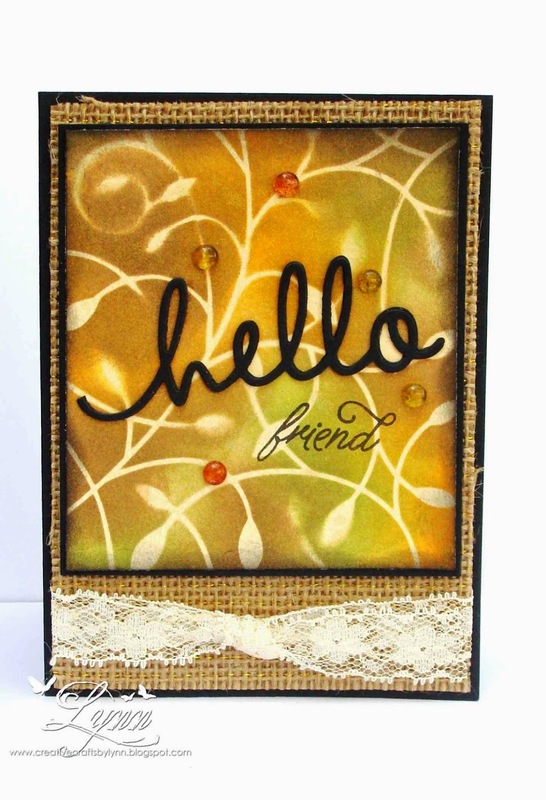 I added a strip of orange textured card stock, some twine and then the sentiment. 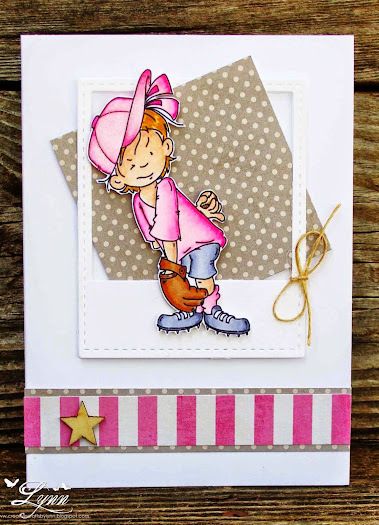 A super duper clean and simple card using a pre-colored image from Deedee's Digis! Head on over to Deedee's Shop though because this also comes in the line version that you can color yourself and some great sentiments. 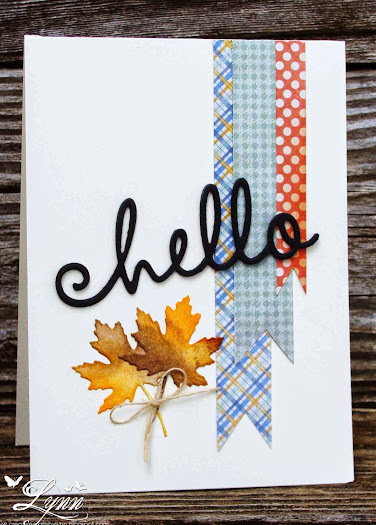 I used vanilla card stock, a scrap of patterned paper, a little faux stitching, and some twine. I also went over the entire wreath with the Wink of Stella clean pen - which really gives it a nice shine. It may be clean and simple but think it still packs a punch to wish someone a happy Thanksgiving. Be SURE and check out Deedee's Digi's as there's a darling freebie for this weekend only to celebrate World Card Making Day. 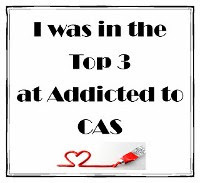 We also have a progressive challenge going on there so while you're visiting the site, check out all the details and come play along with us this month. Anything Goes is the theme of our challenge at Scrapy Land beginning today! 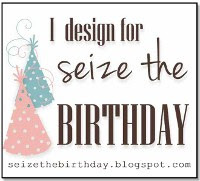 Be sure to enter for your chance to win a $15.00 gift certificate to the Scrapy Land store. That's right......Anything Goes! Just remember to use one of the brands of dies that they carry in the store! Can't wait to see what you create! 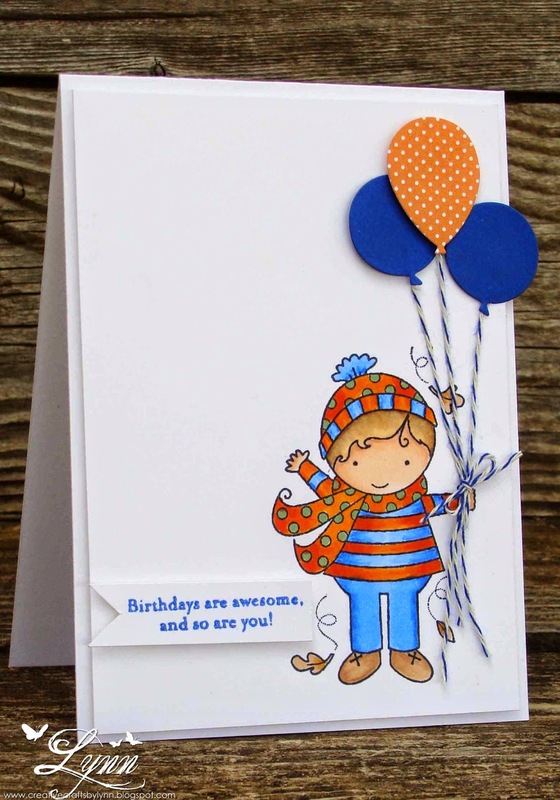 I used a Darcie's Heart and Home image (colored in Copics) and added some balloons from Paper Smooches like you can find here in Scrapy Land store. Some baker's twine was added to the balloons and then the sentiment stamped (a little crooked I might add - I've never stamped anything straight in my life so why start now)!! This little guy is all ready for fall so thought it'd be cute for a masculine birthday coming up next month. 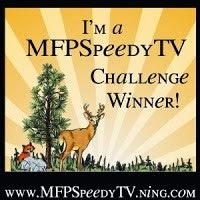 Thanks for stopping by and be sure and head on over to Scrapy Land Challenges and enter your creation. I'm Back...................I got back from my trip and can't even begin to describe what a wonderful time I had! 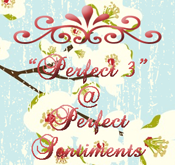 Lots of fun and laughter - and just a marvelous feeling. Something I'll remember forever. I'll be around to everyone's blog as soon as possible. Promise!!! Right now everything is a bit overwhelming with all the things I have to catch up on. 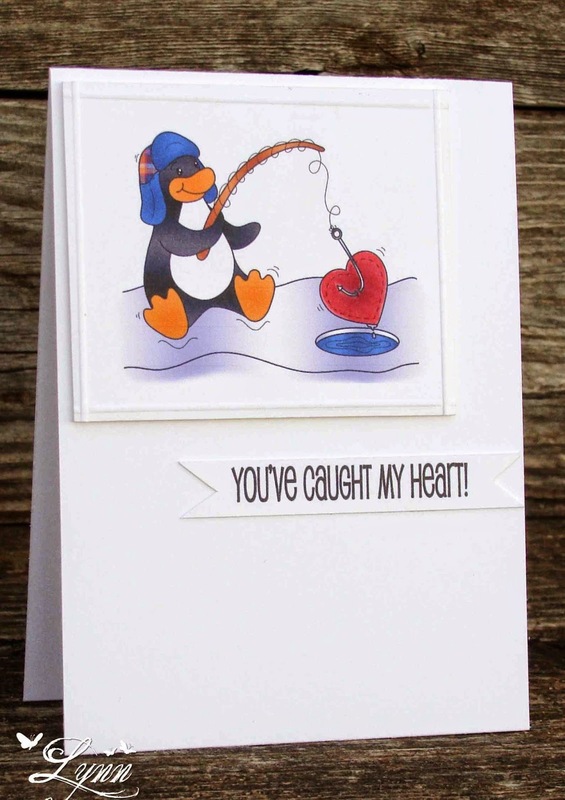 We have another Tuesday Throwdown challenge beginning today and our theme this time is Opposites Attract! 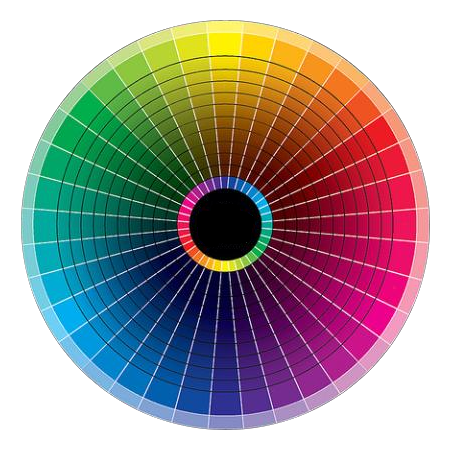 See the color wheel below and use colors to reflect that opposites attract. 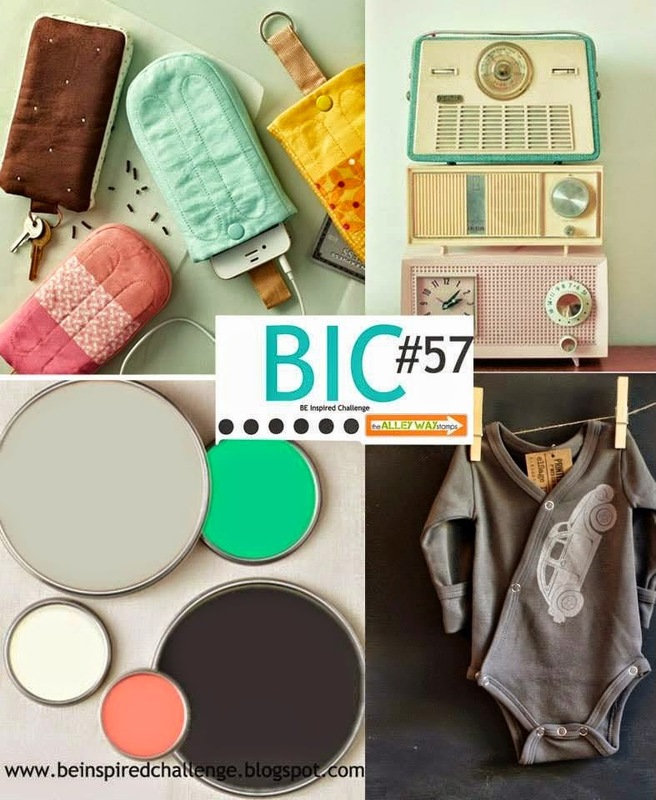 We're being sponsored by Craft Classes Online and you can see all the information about these wonderful classes on the Tuesday Throwdown blog - and by entering our challenge you have a chance to receive a wonderful prize from Craft Classes Online. 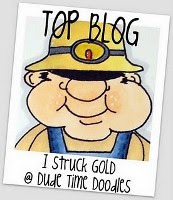 While there also see all the wonderful inspiration from the DT! I used orange and blue for my card stamping the candles and sentiment with a couple of Stamps of Life images. 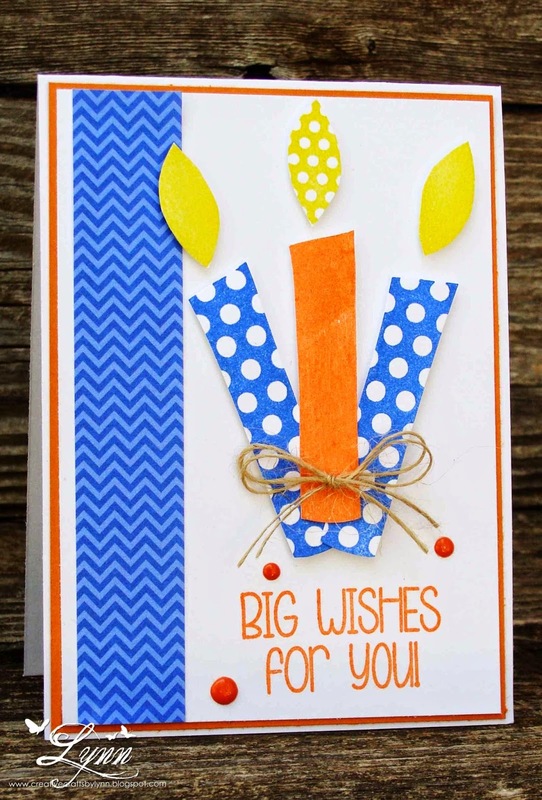 The blue patterned paper was some in my stash and then I added the orange enamel dots that were done with my Paint Pen. I used some clear Wink of Stella on the "flames". 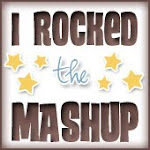 Thanks for stopping by.....and head on over to Tuesday Throwdown now! 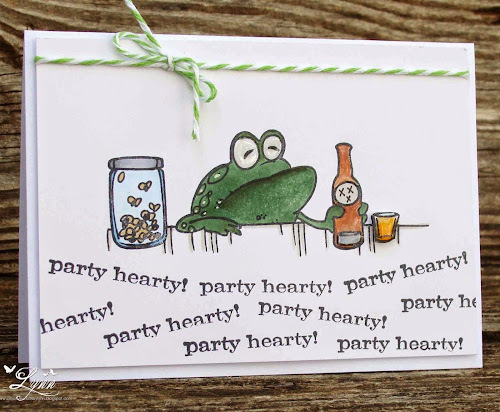 I had five birthday cards to send out this month and as I was going through my stash I realized I was really running short on those - so you may be seeing a few cards for birthdays coming up soon. 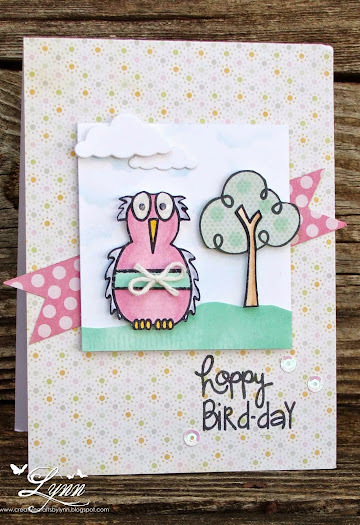 I can't think of anything cuter to use on a birthday card other than this little bird from The Alley Way Stamps. 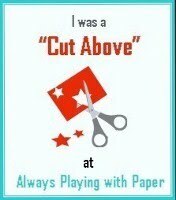 I used Birds of a Feather for the silly guy and the sentiment - and then added the paper pieced tree from Mr. Rogers Neighborhood. The dots on the trees were done with the Wreathed in Love set. I actually stamped a little "grass" on top of the mint colored ground but it didn't show up very much. Oh, and speaking of the mint 'ground'..... I didn't have any paper that color but did have an ink pad. I cut the ground and then rubbed the ink pad over it. Instant colored paper. Some clouds were lightly sponged in and then went ahead and added a couple more fluffy clouds with a die. Glossy Accents were added to the eyes. 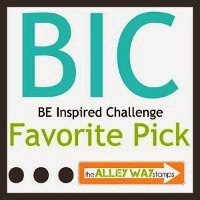 I'll enter this in the Be Inspired Challenge for The Alley Way Stamps. I was inspired by the circles and pink and mint colors.